First in a series of several posts in 2017 about interesting bridges. What, you don’t think we can make bridges interesting? You must have missed what we did to liven up the card game. Continuing our theme of Women’s March – get it? – allow us to introduce you to a woman who made her mark on history by building a bridge. And we for sure do not mean in the metaphorical sense, like how women always have to make amends and be careful of everybody’s feelings like that gut-wrenching scene in Love Actually when Emma Thompson’s character realizes her husband is cheating on her and puts on a brave face for her kids. No, I mean actual bridges.You might think that women were not involved in engineering or construction projects (and if your evidence for this was the Klibanoff sisters’ marks in high school physics, then I can’t blame you) but there were exceptions, and one key lady stands out. 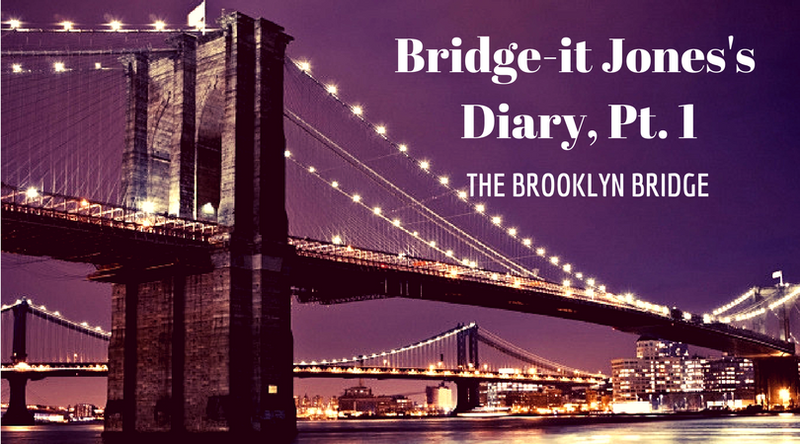 This story comes to us via our friend Maeve at Not Your Boyfriend’s Sports Show, who heard it on an audio tour of the Brooklyn Bridge narrated by Ken Burns. Burns isn’t exactly known for his brevity, so we’ll give you the…wait for it…abridged version. In 1867, John Augustus Roebling came up with an ambitious design for the longest suspension bridge in the world, stretching 1600 feet across the East River in New York City. The Brooklyn Bridge was a feat of construction — and took 14 years to complete. Well, this really happened to John Roebling. While taking some final measurements in 1869, a boat crashed into his foot. Everyone (I imagine) was like “It’s just a flesh wound!” and “Who the heck was steering that boat? !” Roebling was certainly a visionary engineer but he was no doctor. Which is a shame, since he sent the doctor away and decided to treat his own wound through “hydrotherapy” – i.e., pouring water on the wound, i.e., not a real thing. Except he used well water full of bacteria, developed tetanus, and died, leaving his son Washington Roebling to take over the project. The junior Roebling was also an enterprising young engineer, but, like his father, was no doctor. He spent hours examining the bridge’s underwater parts in a cassion of compressed air, and then coming right on up like Bob Barker was calling him to spin the big wheel, with nary a thought given to the detrimental effect such a pressure change can have on the human body. Yes friends, this is how we discovered “the bends,” or decompression sickness caused by sudden and drastic changes in air pressure. Washington Roebling was sick as a dog for the rest of his life, as were many of the workers who were down there in the cells with him during construction of the bridge. With Roebling incapacitated, who would oversee the bridge, by now a half-finished monstrosity of ambitious civil engineering and massive government investment? Who could manage the complex web of finance, government contracts and workers’ rights? Who, oh who, could save it now, without tarnishing the Roebling name or burning any — here it comes —bridges? The smartest thing Washington Roebling ever did was marry his wife Emily, whom he called “”a woman of infinite tact and wisest counsel,” and the second-smartest thing he ever did was keep her in the loop regarding blueprints, calculations and news about the bridge from day one. Long before he got sick, they both went to Europe to study cassions and bridge architecture, so her studies had prepared her well for this moment. She did all the duties of a chief engineer while her husband formally retained that title. She oversaw daily construction progress and decisions, navigating the needs of politicians, employed engineers and all of the workers, and built 👏 that👏 bridge👏. Like, you’re welcome, America. You’re welcome, New York. Raindrop. Drop top. She built a bridge when her man stopped. And you better believe she was the first person to walk across the bridge when it was opened in 1883, carrying a rooster as a sign of victory, which I will now emulate during my life’s proudest moments. At the ceremony commemorating the bridge, the mayor of New York City called it “an everlasting monument to the sacrificing devotion of a woman and of her capacity for that higher education from which she has been too long disbarred.” CAN I GET AN AMEN. Roebling went on to travel the world and get a law degree, and died at age 60. Oddly, her husband outlived her by 20 years and remarried. Of course, it only took another 68 years after the bridge opened for any sort of official marker of her efforts to be installed, but I guess that’s just — one more for good measure —water under the bridge at this point. Since 1951, a plaque acknowledging her work has adorned the bridge.